Date: Sat, 12/7/13 from 8:00 AM – Noon. Info: Meet at the Trailhead Staging Area at 8:00 AM. Bring H2O, work gloves and any trail work tools you have. The park will also have tools for volunteers to use. Parking/fees: If you do not have a park pass, let the host know that you are there for trail work and you can enter the park for free. Areas to to worked on: repair erosion damage on Pemberton, fixing a few off-camber turns, and adding a few bridges to steep wash areas. 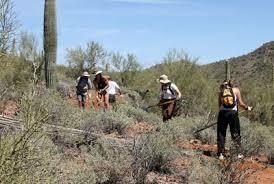 Hours worked will be logged with the MBAA for anyone looking to get their MBAA trail work hours in. Be sure to sign in at the trailhead.